-Seeking a Maternity Model to photograph a “Milk Bath Session” in exchange for 5 professionally edited high resolution digital images. -Must be 30-36 weeks pregnant. -Must fill out and sign model release form. -Must have big enough bathtub with natural window light. -Must be available to photograph within the next two weeks for the session. Email mashagphotog@gmail.com with “Maternity Model” in subject line. Please include a full length photo of yourself, and your due date. I came across this article on babycenter.com and wanted to share with all of you. Many feel that epidural is the only way to relieve contraction pain. However many moms who have gone through labor, have commented on these successful natural pain techniques. In addition to pain medication and epidurals, moms have lots of natural pain-management tricks up their sleeves. We surveyed more than a thousand moms to learn how they eased their labor pain. Here's what they had to say. A full three-quarters of BabyCenter moms used breathing exercises to ride out those contractions. I found that blowing out deep breaths really helped me get through the contractions. The contractions were very intense and breathing through the pain was very helpful for me. It felt like I had to take all my energy and focus it, especially during the tough contractions. If I moved or lost focus on my breathing, I felt like I lost control of my body and the pain would take over. Half our moms found that a simple change of position helped relieve the pain. (Exercise balls can be great for this – a quarter of BabyCenter moms used one). Don't be afraid to move around, walk, sit on a ball, or whatever, it progresses labor faster. Learn about your options for labor, birth, and after, and make your wishes clear. Many moms rocked their way through contractions. I got through it just one contraction at a time, through breathing, rocking, and moaning. If you're up for it, try a little walk. It helped about one-third of the moms in our survey. Don't underestimate the power of a good massage – be it your back or your feet! I packed a rice heating pad, which was amazing for my back labor. A handheld massager was very useful in early labor when the pain was in my back. My husband rubbed my feet with aromatherapy lotion. I was in heaven. Learn massage techniques you can use during labor, like "nerve strokes" and the "double hip squeeze". Almost one-fifth of BabyCenter moms got some watery relief. I spent the majority of my labor in the bathtub, which helped manage the pain and also relaxed me. Got a nice beach in mind? Go to it during contractions. You can also try visualizing labor before it happens. The biggest advice I have is to envision labor in your mind beforehand. I prepared by telling myself that it's going to hurt, but it won't last forever... like a tattoo. Take yourself somewhere else mentally during contractions. Moms share how they made it through the toughest moments of labor. If you're a music lover, try a few tunes for natural pain management, as 14 percent of our moms did. (Looking for some song ideas? Check out our labor playlists). I packed my MP3 player and used it while in labor. The music helped me relax and took my mind off the contractions. I have another announcement for you. Sadly, I will not be booking any more photography sessions in California. I will now be working solely in Portland Oregon and surrounding cities. I am grateful for all the friends I have made here in Los Angeles. Some of you started out as clients, and quickly became more. Many of you have taught me so much. I am grateful to have worked with you, and to know you as a person. I will strive to keep in touch with all of you. You know who you are. This is a happy announcement. And don't forget, I do travel. So if you need me in any part of the world, just contact me and we will work something out! Does your idea of delivery comfort have less to do with the bed you’ll give birth in, and more to do with the medical backup you'll have on hand? If so, a hospital is probably the most comfortable choice for you — putting you in good company. Giving birth in a hospital is by far the most popular choice of expectant couples in the United States. It’s the choice for women who have what’s considered a “high-risk” pregnancy (e.g., if you’re 35 and over, are pregnant with multiples or have conditions like gestational diabetes). It also offers the most options in terms of who can make your delivery: While most birthing center and home births are attended by midwives (certified or direct entry), your hospital birth can be overseen by an OB-GYN, a family physician or a certified nurse-midwife (96 percent of CNM deliveries are, in fact, in regular hospitals). Doulas are welcome, too. Just as there are pros and cons for every choice you'll make when it comes to your childbirth experience, there are pluses and minuses when it comes to having your baby in a hospital. It’s the safest option. If you're at high risk, it's the safest childbirth environment for you and your baby. Ditto if an unforeseen complication arises during labor (such as a prolapsed cord or placenta abruption, for example). It’s close to an operating room. If you need a cesarean section (either planned or emergency), it's the only place you can have one. And you won't have to be transferred mid-labor if it looks like you'll need one — you'll just have to move from your birthing room to the operating room. It offers the most advanced technology. On-staff pediatricians and, in many hospitals, sophisticated newborn medical technology are available should your baby need immediate medical care. You have easy access to pain relief. Anesthesiologists on staff are almost always available to provide pain relief medications as you request, from epidurals to narcotics. Hospitals, especially larger ones, can seem impersonal and intimidating. Taking a tour ahead of time can help you feel more familiar — and more comfortable — at your hospital of choice. Keep in mind, though, that more hospitals, even those big ones, are doing more and more to have a "family-friendly" feel in the labor and delivery wing. Even private rooms aren't that private. There's a lot of coming and going in hospital rooms — it may often seem like there's a round-the-clock revolving door of residents, nurses and other hospital staff members hovering around your bedside. You can expect to get less rest, too, at a hospital for the same reason ("time to check your blood pressure again"). Separations are often routine. Even if you've chosen to "room-in" with your baby, there will be times when hospital routines will separate you, including for newborn screenings. Hospital policies rule. Though hospitals are more open to birthing alternatives than ever before (if only to keep up with the demands of expectant parents who've come to expect more), they're bound by protocols and procedures — which means you will be, too. Still, chances are good that with the help of your practitioner you'll be able to create a birth plan that gives you the birth experience you want, even in a hospital setting. Without a doubt, hospitals have come a long way since the days when deliveries took place in cold, uncomfortable, sterile delivery rooms. Today, the equipment's still sterile (and that's a good thing), but the surroundings are typically far from it. If your hospital has an official policy of family-centered maternity care (many do), you can expect birthing rooms that are comfortable and homey, designed in warm, soothing colors, with all the medical necessities at hand (but hidden behind armoires), dim lights, private bathrooms (including showers and/or baths that can be used for hydrotherapy relief during labor), and ample space — including sofa beds — for family members and your birth coaches (your spouse, a doula etc.). Is the hospital in your insurance network? Although the Affordable Care Act now requires all insurance plans to cover maternity care, the deductibles, coinsurance, copayments or similar charges for each service can vary, up to an out-of-pocket maximum for in-network providers. If you’re out of network, however, the charges can skyrocket. What amenities does the facility offer? Consider the type of birth you’re hoping to achieve. If you’re hoping for a more natural birth, for example, does the facility offer or allow birthing tubs? If price is less of a factor than convenience, you may also want to consider if the facility offers labor, delivery, recovery and postpartum (LDRP) rooms, where instead of moving between several rooms from labor through recovery you’ll stay put. What’s the C-section rate? Rates of C-sections can vary widely from hospital to hospital, from 7 percent to nearly 70 percent, so it’s a good idea to look into your hospital’s rates online (here is a good source to get started). If your hospital of choice has particularly high rates, you can ask why when you visit the hospital. Does the facility support breastfeeding? If you’re planning to breastfeed, you may want to check if your hospital is a certified “Baby-Friendly Hospital” (see the full list here). The Baby-Friendly certification means the hospital follows World Health Organization and UNICEF guidelines to support mothers in successful breastfeeding, including allowing mothers and infants to room together 24 hours per day. Don’t fret if your hospital isn’t on the list either: Just be sure to ask about breastfeeding assistance your hospital offers when you take your hospital tour. Finally, take a tour of the facility you’re most interested in using, if possible at around week 30 to 34 of pregnancy. This will give you a chance to ask questions, clear up the smaller details and meet some of the staff who will be assisting you on D-Day. Your hospital will work with your insurance company to determine what your co-pay will be. While the Affordable Care Act guarantees some low- or no-cost prenatal and infant care, insurance companies vary on the amount charged for your hospital care and stay during labor, delivery and recovery. How much you pay out-of-pocket depends on factors including treatments needed for you and your baby, the facility at which you deliver, your health insurance and more. Every year my family and some good friends pack up our stuff, and take along 5 hour drive up to Yosemite California. This is one of those trips that we look forward to all year long. When our trip is over, we are longing to do it again! Yosemite Valley itself, is a pretty busy place. It's buzzing with tourists, kids, and wildlife. But for me, it's a bit too crowded, so my family and I like to stay at the Wawona Campground. Wawona is about a 45 minute drive to Yosemite Valley. Not bad at all considering how beautiful the drive is. Booking your campsite is another challenge. You only have 1 day out of the whole year to claim your stake and grab your spot! And you better be quick! If you're not ready to click the "RESERVE"button on the exact hour that it becomes available, chances are you either won't get a reservation at all, or you will not get the spot that you want. Regardless, camping in Yosemite is still our annual family tradition, and we will be trying to do it every year as long as we can. Here are some of the photos from this year's trip. I was particularly inspired by Ansel Adams. The black and white photos of Half Dome made me want to take a stab at trying to photograph in the same style. Here's my take at Ansel Adams. You can view "The moment before time begins 20 images of baby crowning" HERE. My image is the 4th image in the gallery. Thank you to the strong Mom who pushed with all her strength, and invited me to capture and share this moment. Okay so this is not really birth related, but then again, it kind of is. I wanted to share this adorable little nursery print with all of you expecting parents out there. It's customizable and just so sweet. Anyway check it out for yourself! *WARNING* This post contains images of Birth, and is for mature audiences ONLY. Readers may find these photos graphic. Thanks for stopping by, fellow photo lovers! I have a special treat for you today, and it comes in the form of a cute newborn named Odessa. She came into this world on May 10th, 2016 weighing 8 pounds 4 ounces and measuring in at 21 inches long. Her parents, invited me to take pictures of the birth at their home. What an honor to capture such a pivotal turning point and special moment in their lives. I know they will treasure these pictures forever. Little Odessa is just as darling as can be. Capturing her little chubby cheeks, tiny feet, and cute sweet face was so much fun. What a sweetheart! As a Portland Oregon Birth Photographer, I truly feel grateful & honored that her parent's asked me to be a part of this special day. Thanks again, you guys! Dear awesome/amazing/loyal/world's best blog readers! As a Portland Birth & Newborn Photographer, I get to hang around lot's of adorable babies! Today's post is all about a certain baby with the kind of chubby cheeks that will surely put a smile on your face. Miss Odessa was so much fun to photograph and our session turned out so perfectly! 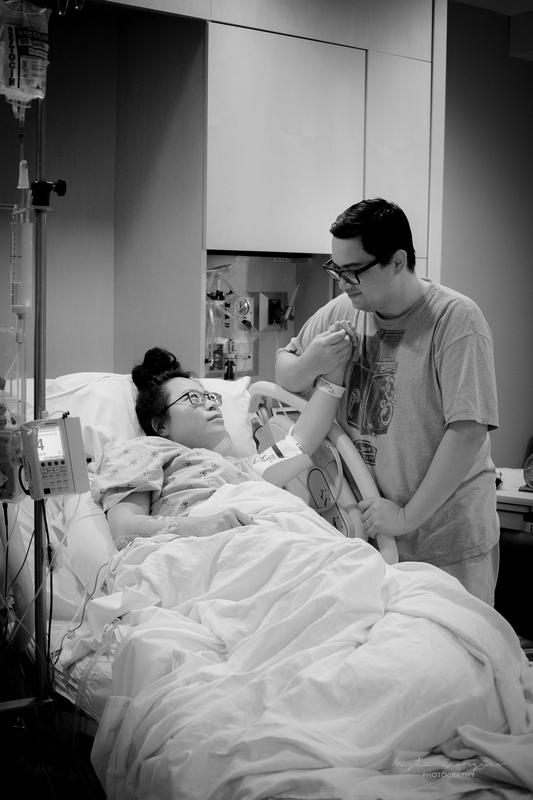 This particular session was a very special since Jessica, Odessas's Mom, brought along some personal items to make this birth announcement. The items added a whole other level to our photo shoot and I love how they photographed, as well. Odessa is so adorable. She was this perfect sleeping beauty. Sometimes babies just don't want to go to sleep, and sometime they are perfect. This was one of those times. I couldn't have asked for a better session! You'll see what I mean below! 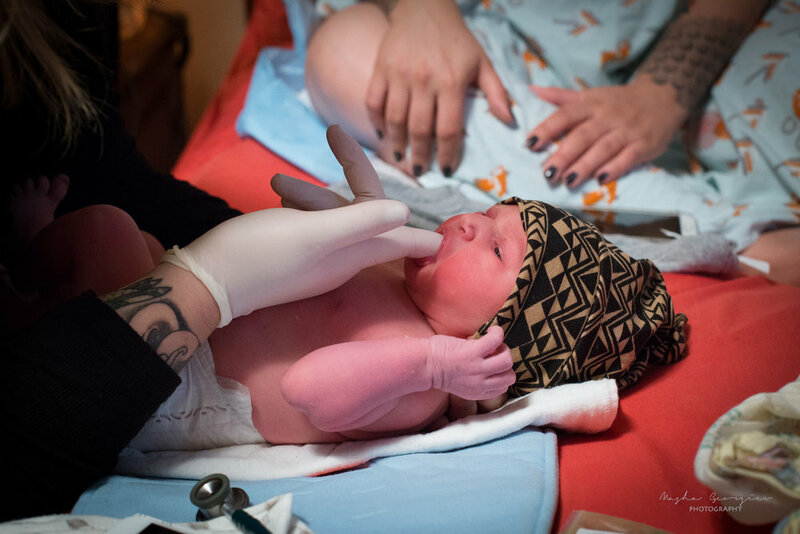 Portland Oregon Birth Photographer | Umbilical Cord, have you seen it? 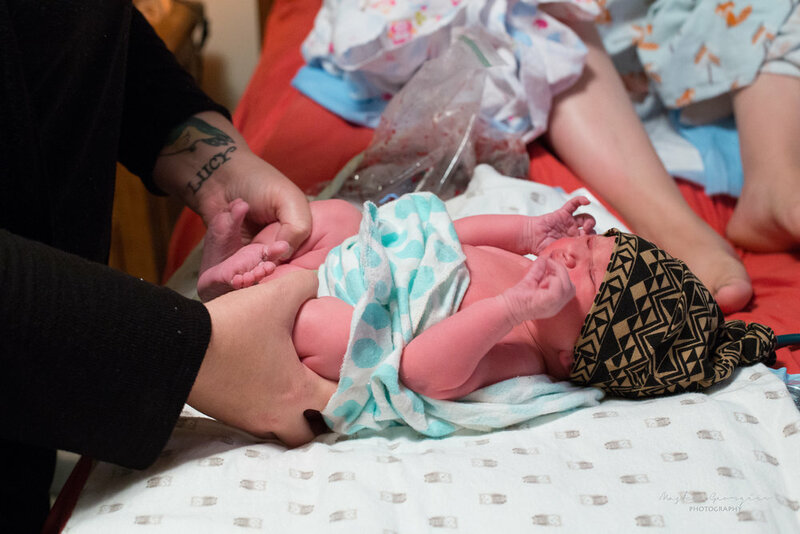 As a Portland & Gresham Oregon Birth Photographer, whenever I share an image of a baby still connected to his or her umbilical cord, I receive more engagement than almost any of my other posts. There is POWER in seeing how we nourished and sustained our child. There is UNDERSTANDING that comes from seeing/touching/acknowledging the cord that pulsed life. One of my biggest 'birth regrets' is that I didn't get to see my own umbilical cord when I gave birth to my son. It was cut before I had time to think or ask. I'm so happy that more and more providers are giving mamas the space and the time to appreciate their cords. Did you have the opportunity to look at and examine your umbilical cord? What did it make you think or feel? Maybe just as important as the techniques they teach you in birthing class are the friends you meet. Lamaze class is a great place to connect with other couples with babies the same age. At my class, we saw a few graphic videos, learned a few breathing techniques, and got a bunch of numbers. I’m not sure how much we used the techniques we learned, but going to Lamaze class each week helped me feel as though I was getting more prepared. That due date has been on the calendar since your first visit to the doctor, and too often we count on that day as if it will really be the day. But unless you’re having a scheduled C-section, it’s more than likely you will have an early arrival or a delayed departure. So don’t panic if it’s a week past your due date. And be prepared a few weeks before, just in case. If you’re planning to give birth in a hospital or birthing center, pack a suitcase so you can feel as comfortable and relaxed as possible. Make sure you pack your own camera and an extra disposable one. It’s important to have this just in case your camera runs out of batteries or the shutter breaks—this has happened to people I know, so always carry a spare! Also remember the following: makeup, travel sizes of your shampoo and conditioner, toothbrush and toothpaste, deodorant, travel razor, hair brush, and lip balm. Things you will thank me for reminding you about: your favorite energy bars, crackers, and bottled juice water; breath mints; your address book with all of the phone numbers of people you might want to call. By now you may have heard a lot about a “birth plan.” This is simply an outline of how your ideal birth scenario would go. It’s important that your doctor be aware of your desires. I am all for outlining your wishes and working toward making them a reality, but just be prepared that things don’t always go as planned. Keep in mind that a successful birth results in a healthy mom and baby. Period. Whether you want an epidural, hospital birth, water birth, or natural, get all the facts, do your research, know your options, and talk to your doctor and other moms. Don’t let anyone discourage you or encourage you to go against your instincts. But don’t be afraid or upset if you have to change course. Have your plan; envision what you would like, but keep an open mind. The ultimate goal is to feel confident and prepared for your big day. Many doctors and hospitals will encourage you to fill out all of your paperwork and consent forms a few weeks before the big day. The last thing you will want to do as you breathe in and out of contractions is fiddle with insurance information. I wish I’d known of this option. I arrived at the hospital six centimeters dilated, and delivered less than two hours later. I would have signed just about anything at that moment. So if you can, pre-register. Stays in the delivery room! What they don’t tell you in birthing class is that you may poop, pee, or fart while you’re pushing. It’s part of the process sometimes, and your doctor is used to it. Don’t worry or think too much about it if it happens to you. Know this: It is perfectly normal. You never know how your body or mind is going to react at any given time until you’re put in the situation. Calm, genteel women have turned into cranky lionesses, and you may yell, scream, or say things you don’t mean or later feel bad about. I would issue a simple disclaimer to everyone who is going to witness the “miracle of birth”: It might be laced with a few profanities or some unsightly things, and you are not responsible for what comes out (of either end!). You may fall in love with your little one at first sight, but be prepared if you don’t— for some new moms, the feeling may take awhile. Lack of sleep combined with the fact that your body is adjusting to a hormonal tidal wave and the loss of the baby inside of you make it natural to feel a little “blue” or out of sorts right after the birth. Nearly 75 percent of new moms experience the “baby blues,” but don’t worry, it usually goes away after a few weeks, and each month it gets better. If it doesn’t get easier, contact your doctor. It could mean you have postpartum depression; it affects 10 to 20 percent of new moms. If you feel this has a hold on you, talk to your loved ones and doctor. They will get you the help and resources you need to overcome it. 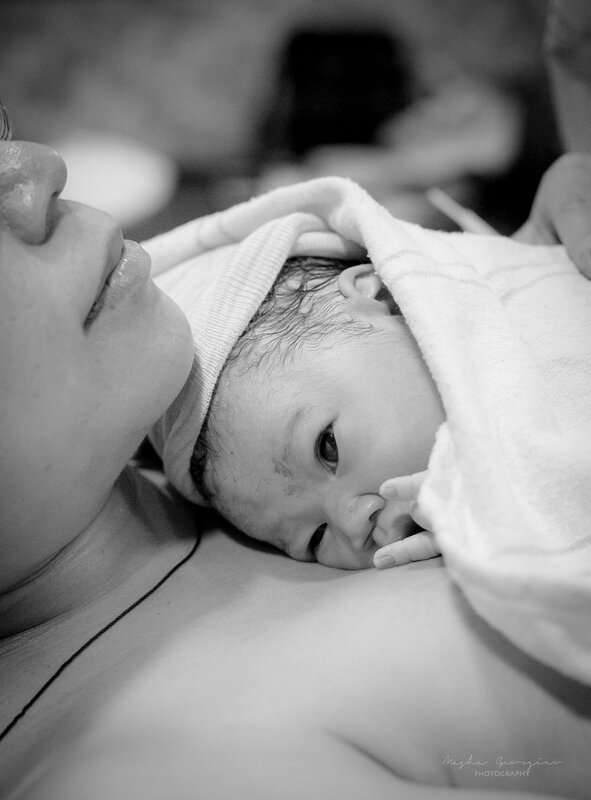 After giving birth, I didn’t feel sad, per se, so much as numb, emotionless. I was diligent about making sure my son had all of his needs met, but I wasn’t feeling that connection. I was a robot or a walking zombie, and this made me feel guilty and confused—why wasn’t I feeling baby bliss? It wasn’t until a few weeks passed that—out of nowhere—something clicked inside me. I still remember feeding him on the couch, looking into those little eyes, and it just hit me—this wave of intense love. I was awestruck and have been ever since. I haven’t told anyone that before, but I am telling you. So if the postpartum discomfort and the emotional stress have you a bit unraveled, be patient. The connection will come, it will get easier and easier, and you will feel more and more bonded. Relax and trust that. Before this pregnancy journey ends, give yourself credit for making it the best possible experience. You’ve lived through a deluge of information. You’ve survived the old wives’ tales and “good advice.” You’ve created a space for your baby and your partner and rearranged your home. And you’ve taken care of your body and mind. It’s pretty amazing you did it in such a short span of time! So while you’re waiting, why not write down in your journal how this transformation can carry you into the next episode of your life—going from Hot Mom-to-be to a Hot Mom! Excerpted from The Hot Mom-to-be Handbook by Jessica Denay. Denay is a mom-lifestyle expert and founder of Hot Moms Club. She’s appeared on hundreds of TV shows and in dozens of magazines as an authority on everything “hot” for moms. As a Portland Oregon Birth & Newborn, my favorite thing to photograph is expecting Mamas, newborns, births, and capturing families with their new baby. Here are some of my top reasons and justifications for hiring a professional newborn photographer. They are only this tiny once! I know you’ve heard it a million times before, but your tiny little newborn will grow so quickly!! In a blink of an eye your sleepy baby will be transformed into a wobbly toddler and then into a running child. Years from now you will hold the photos from your newborn session in your hands and be able to re-live the emotion of holding your child in your arms for the first time. You’ll pull out those photos and be amazed at how big your child has grown. You are truly capturing a fleeting moment in time. 2. A glimpse in time. The beautiful, curled up sleepy newborn photos that you see are taken within the first 4-12 days after birth. You have a limited time frame to get these photos taken and you don’t want to be searching for someone who may or may not have availability during the days just after your child is born. My advice is to hire a professional photographer before you deliver so you won’t waste any of those fleeting moments with your new baby. This way when your baby is sleeping you aren’t searching the internet for a photographer, you can actually sleep as well. You can thank me later. I would recommend having your photographer in place before you reach 32 weeks in your pregnancy, just in case you deliver early. If you are looking for a birth photographer booking early is KEY. Most photographers only book a limited number of births each month, so the sooner you book the better! You won’t want to hand your sweet new baby over to just anyone, and you should make sure your photographer is trained and knowledgable in newborn safety. Professional Newborn photographers are familiar with exactly how to hold babies safely, when and how to pose babies, and more importantly, how not to pose your baby. We are trained to treat babies safely and respectfully. No photo is more important than the safety of a baby! If you have certain poses in mind ask your photographer before hand if they have done it before and if they know how to do it safely. Ask them if they have an assistant who does spotting or if they do composite images during the editing process. Most professional photographers will take several photos and merge them into a composite to achieve certain poses. Not all photographers do all poses, so ask before you book. These days, most people have DSLR cameras. However, most of my clients will admit to me that they turn their camera to auto and let their camera do the work. Modern cameras can take great images on auto, but things can go very wrong too, especially with bad hospital lighting and red baby skin. This can result in dark images, blurry images or over exposed images. Your photographer will know how to use their equipment and will have manual control over their camera. They will be choosing their ISO, shutter speed and f-stop to ensure the image is well exposed. They will know their equipment in and out to get the best possible image of your little one. They will also have professional grade lenses and lighting to help capture tiny details that regular lenses won’t catch. Photographers carefully re-touch your images. We use products like photoshop and lightroom to ensure that your images are properly exposed, the colors are perfect and the image is polished to a professional level. I always aim to get the best possible photo straight from my camera, but every image can be enhanced through editing, especially newborn photos. Lots of babies have red feet and hands or may have yellow skin from being jaundiced. Most babies have peeling and flaky skin, baby acne, or scratches from their nails. Some babies even have bruising as a result of a difficult delivery. A professional photographer will know exactly how to edit your images to get you wall-worthy images of your sweet little one. Every photographer has their own unique editing style. Your photographer will pay close attention to the details. With newborn photography, babies are posed right down to the position of their hands and lips. Blankets are smoothed out. Fabrics are ironed. Background clutter is removed. The time of day and babies’ feeding schedule are taken into consideration. The temperature and ambiance of the room is carefully planned. Every part of the image and your session is carefully planned to ensure that you get the best images possible. There are certain variables that a professional photographer knows how to manipulate to help ensure an easier and more successful session. You also get to access a professional photographers prop collection and won’t have to worry about purchasing your own props. I mention this last because, in my opinion, it isn’t the first thing that should be considered when hiring a photographer. You should definitely search for a photographer that fits with your budget, but don’t make that the only reason you hire someone in particular. This is an investment and something that can’t be redone at a later time. Consider your budget, but also consider the photographer who will make your investment worthwhile. A photographer who charges very little may not have the ability to provide you with the type of photos you’ll want to proudly view time and time again. You also have to take into consideration quality vs. quantity. Do you want 150 mediocre images or 40 images that take your breath away? The journey to motherhood comes with a lot of milestones and changes! As both a mom and a photographer, I cannot stress enough how important it is to document these stages along the way. You will never look back and regret that you took the time to get portraits of your child, only that you didn’t. Especially from birth to two years, I recommend getting portraits done every 3-6 months because changes happen so fast!! After that I recommend, at the minimum, a yearly portrait of your child and your family! Masha Georgiev Photography is one of the most sought out photographers in Los Angeles. If you are interested in booking a shoot with Masha Georgiev Photography or would just like more information please contact Masha. Whoa is this the month of deals or what?! Now is the time to cash in! $100 Print Credit with any session booked in April or May! Must book by June 1st 2016. Can be redeemed by 12/31/2016. Any session can be purchased as a gift. Please visit www.mashageorgievphotography.com/investment for details on what is included with each session. As a Portland Oregon Birth & Newborn Photographer, I love answering all your questions! Portland Birth Photographer | April Special! As a Birth Photographer in Portland Oregon, Your baby's birth is one of the most timeless and momentous occasions of your life. Whether it is your first or fifth child, no two births are ever alike. Nothing compares to the moment you meet your little one for the first time. The beautiful beginnings of a new family, new traditions, and a new life. Sadly, these memories can fade so quickly. I can barely remember what happened during the first hour after I delivered my son. Adrenaline and excitement clouds your memory. Birth photography helps capture & preserve these precious memories for you. Parents at that time are so focused on a million different things- the health of mom, the health of baby, the pain! Who wants to think about taking pictures at a time like this?! That's where I come in! Wouldn't you rather hold your partners hand during this special time, than be distracted by taking photographs? I am there to capture your birth Story. I am there to capture that special once in a life time moment, when you meet your little miracle for the first time. When you hear their first cry, when you finally get to hold them in your arms after months of anticipation. I regret not hiring a birth photographer for my son's birth. That's why hiring a birth photographer makes such great sense! You are promised beautiful professional looking photos.....and of course a tear-jerking Birth Story Slide Show! Let's create your Birth Story together! "When you can't find the words to express yourself, let the photography do the talking." NTRODUCING: TWEEN Sessions! Do you remember what it was like being between a kid and a teenager? Leaving the comforts of being a 6th grader in a school that you have grown to love so dearly, to enter a whole new environment, with new personalities, strange kids and new teachers? Tween Photography has become a very important tool in self-esteem building. This is the time before drawing becomes boring, or playing an instrument is not cool. This is the time to get creative, capture their passion, and most importantly--Just let them have FUN! For more info please shoot me an email: Mashagphotog@gmail.com or just send me a msg.